To write an outstanding book in one genre may be unusual, to write one that is outstanding in two genres may be rare but to write one that is outstanding in three genres is just a little bit unfair to other authors. Yet, that is exactly what Fuchsia Dunlop has done with the excellent Shark’s Fin and Sichuan Pepper, an excellent memoir, food book and travel book. Fuchsia Dunlop was a sub-editor for the BBC when, having travelled in China, she was awarded a British Council scholarship to study in Chengdu, the capital of Sichuan. Soon tiring of academia, she talked her way into becoming the first Westerner to be accepted as a student on the three month professional cooks’ course at the Sichuan Institute of Higher Cuisine. Having completed this course, she spent the following years immersed in Chinese food, travelling in Sichuan, Hunan, Xinjiang and Yangzhou, writing two excellent regional cookbooks – Sichuan Cookery and Revolutionary Chinese Cookbook - and becoming, almost certainly, the leading authority on Chinese cuisine in the UK. Food writing needs to make me want to rush out and immediately stuff my face with the kind of food that features in the book and Shark’s Fin and Sichuan Pepper did that in spades, giving me an almost desperate urge to run to the nearest Sichuan restaurant, which, unfortunately, was not practicable, given that I was reading the book on the Tube on the way to work or in the evening at home. Fuchsia Dunlop has the gift of being able both to describe dishes accurately but also to make the flavours and smells leap off the page in mouthwatering fashion. I was particularly gratified that she gave a fascinating description of being taught how to cook fire-exploding kidney flowers, which was, coincidentally, the first Sichuan dish I ever ate, at the great Bar Shu in Soho. 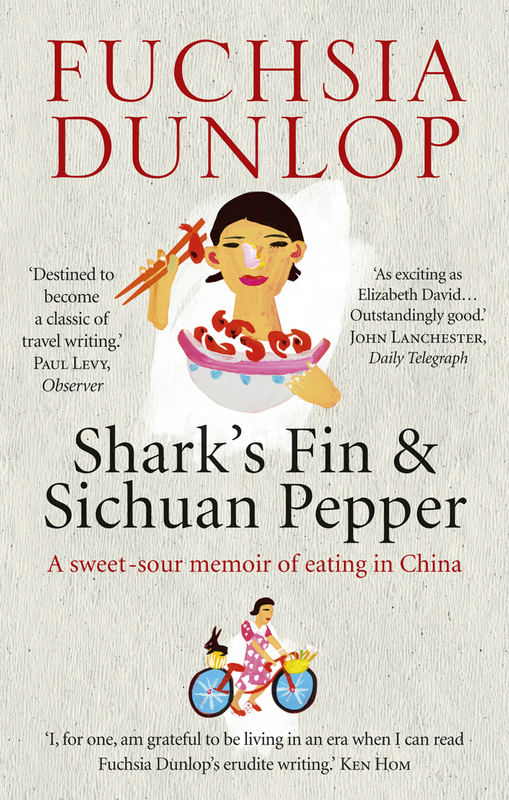 However, Shark’s Fin and Sichuan Pepper doesn’t just excel in its descriptions of dishes and ingredients, it is a fascinating treatise on regional Chinese cuisines in its own right, initiating the reader into the very different cuisines and eating habits of the various parts of China that Ms Dunlop travels in, from the spicy, complex dishes of Sichuan to the delicate tastes of Yangzhou and the central Asian cuisine of Muslim Xinjiang. I learned a huge amount from this and, having read this, I appreciated the wonderful recent BBC TV series, Exploring China, even more. 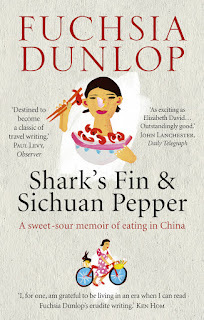 But Shark’s Fin and Sichuan Pepper is not only a fine piece of food writing, it is also a great travel book as she describes and considers the changing nature of China during the years she has spent travelling and working there. She writes evocatively about the speed with which the country has urbanised, tearing down old parts of cities and towns to be replaced with modern, concrete building and high rise blocks. To mention Exploring China again, I was struck by the difference between the description of Chengdu in the early ‘90s in Sharks’ Fin and Sichuan Pepper by comparison to the soulless concrete megacity of 2012, shown on TV. As well as this, Ms Dunlop talks passionately and unsparingly about how pollution and other environmental issues are affecting China and, in particular, its food resources. She also addresses corruption and the way in which municipal funds are stripped away by local officials from the locals who really need them. But, underlying the mouth-watering descriptions of food and the fascinating portrait of a changing China, maybe the most profound journey the book describes is that of Ms Dunlop herself. Because, gradually, as the book progresses we see her shuffling off not just the culinary shibboleths of her Western upbringing but also many other cultural paradigms until she finds herself “thinking Chinese”. To illustrate the way in which she grows accustomed to the omnivorous nature of Chinese life, in which almost any animal protein appears up for grabs, there is a very personal section of the book where she describes being at home in England and, upon finding a caterpillar in some salad, eats it to see whether she has left her Chinese eating habits in China. Of course, she finds that eating caterpillar is unexceptional. By the end of the book, Ms Dunlop appears to be almost split between two cultures in which she paradoxically appears both at home and a visitor. Interestingly, she talks about Hong Kong, that former colonial jewel, as being a kind of decompression chamber for her between her two worlds. I love this book and have also enjoyed each of Ms Dunlop’s cookbooks and so I am self-confessedly unobjective in writing about it. Its subject matter is also so far within my wheelhouse that two of my family, completely independently, have bought me copies of Shark’s Fin and Sichuan Pepper but, nevertheless, I cannot recommend this highly enough to anyone with an interest in food, travel or China. I'm familiar neither with the author nor the book, but it sounds terrific. And I agree: to excel across multiple genres like that is a tremendous feat indeed. thanks for bringing a book to my attention that I might otherwise never have run across.